Two polar bear cubs that came to Winnipeg when they were orphaned will be introduced to Winnipeggers at their new home, the International Polar Bear Conservation Centre, on Oct. 31. Two polar bear cubs that came to Winnipeg last month when they were orphaned will be introduced to Winnipeggers at their new home, the International Polar Bear Conservation Centre, on Oct. 31. The cubs, one male and one female, arrived at the end of September. “The cubs will spend a few more days exploring their outdoor enclosure off exhibit before making their public debut on Friday,” said Dr. Brian Joseph, director of zoological operations at the Assiniboine Park Zoo, in a statement. Manitobans are being invited to help name the cubs by voting on a list of possible names on Facebook. 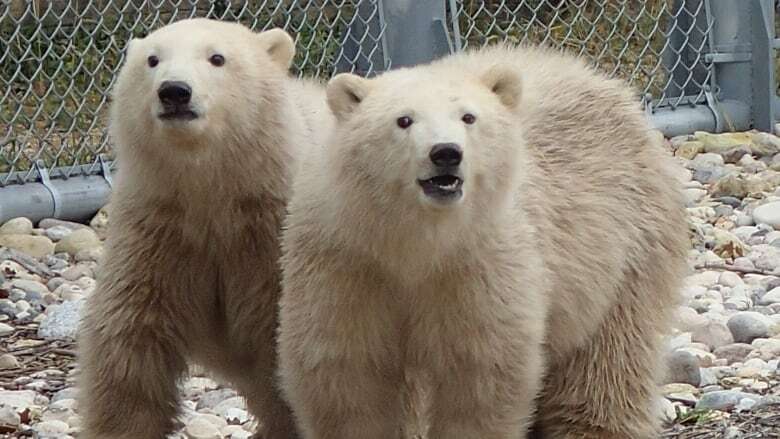 The zoo said the names were provided by students from three northern Manitoba schools, Gillam School, George Saunders Memorial School, and Fox Lake School, located in the area where the cubs were found. Blizzard, Jack and Keewatin are the possible names for the male. For the female, Crystal, Trinity and Star are the options. The deadline for voting is 10 p.m. Wednesday, Oct. 29. The cubs are now about 11 months old and have successfully ended a standard 30-day quarantine period, the zoo said. The cubs' names will be announced on Friday when they make their public debut. Meanwhile, the underwater viewing tunnel at the Journey to Churchill exhibit remains closed, as crews continue to repair some silicone sealant that the polar bears had chewed on in mid-September. A zoo spokesperson told CBC News there is no firm re-opening date for the tunnel, as the repair work includes the application of new sealant that has taken longer than expected to cure. The zoo noted that the rest of Journey to Churchill is still open, and all of its other polar bears are currently on exhibit there. Watch a video of the cubs the zoo released Monday.